Just when you thought it was safe to tap out after dark, Magic 2011 brings us yet another Vampire-themed preconstructed deck in the Black/Green Reign of Vampirism. Both Zendikar-block Vampires decks (Rise of the Vampires and Fangs of the Bloodchief) relied on fast, Black Weenie-style tactics with low casting-cost critters to overwhelm the opponent before they established board position, with a couple aces for the endgame to break through a stalemate (such as Anowon, the Butcher, Zombie Goliath, and Blood Tribute). Vampires in the Zendikar world were a carefully-crafted tribe with a deep backstory and vital role to play in the world’s lore. By nature the Core Sets are devoid of such placement, and exist more or less on their own. To see how M11’s Vampires fared, I suited up for battle against Sam, who was piloting Power of Prophesy, the set’s U/W theme pack. With turns one and two passing with nothing but land to show for it, I’m growing worried that I’m off to a slow start. 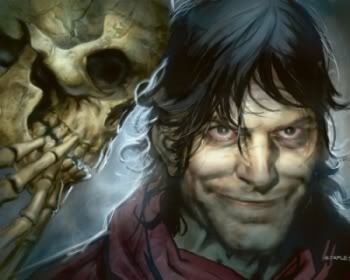 This favours Sam, whose deck needs a little time and space to get going, but is an omen of doom for mine. Sam’s on the play and her turn 2 drop is a Blinding Mage. I have no answer. The Mage attacks on turn three and draws first blood, but I’m able to hit that third land drop that enables me to play a Barony Vampire. She’ll be able to tap it down for attacking, but it’s a start. Sam returns with a Visions-reprint Cloud Elemental. 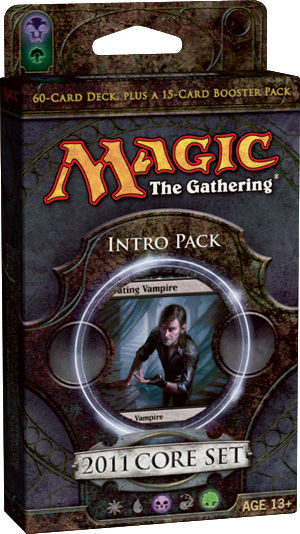 The Elemental can only stand by uselessly as I drop my foil premium rare, Captivating Vampire. The +1/+1 is greedily welcomed by my attacking Barony Vampire, and just like that I’m ahead, 16-19. Now entering turn 5, Sam draws, attacks with the Elemental, and passes. I keep the pressure on with a Viscera Seer and Child of Night. Although her next turn play is solid- the foil Conundrum Sphinx, I draw into a Bloodthrone Vampire and just like that I’ve got five Vampires on the board for the Captivating Vampire’s special ability. The Conundrum Sphinx is ‘persuaded’ to join the winning team, and Sam’s prospects for victory are rapidly diminishing. A turn 7 Sleep buys her a little more time. My play is the detested Sorcerer’s Strongbox, which I can’t activate this turn having only 5 mana available. Sam stalls again with a Wall of Frost, which I also relieve her of. A Quag Sickness takes care of the pesky Blinding Mage, and Sam’s fate is soon sealed. An early start this game sees me with a Viscera Seer and Bloodthrone Vampire in the first two turns, while Sam looks to gain card quality advantage through a Crystal Ball played on turn 3. My take is a risk- a solid start, but I have expensive cards in hand (Diabolic Tutor, Corrupt), and the Captivating Vampire I again find myself with is stuck for lack of one more mana. With the Crystal Ball filtering her draws, I know I don’t have the luxury of time. I’m further set back on turn 4, when Sam’s Aether Adept bounces the Bloodthrone Vampire to my hand. My Vampires have done a little damage to Sam, but I can barely afford the regroup. I recast the Bloodthrone and hope for the best. Sam keeps her momentum going with an Augury Owl, the new Sage Owl variant, but I hit a bit of luck and draw a Forest. The Captivating Vapire comes down, and my newly-pumped minions rush in for 4. Sam’s now at 13 life, I’m in good shape with 18. A Water Servant complicates matters when Sam casts it on turn 6. With the ability to pump in either direction (to a point), it can easily hold off my smaller Vampires though the threat of an attrition I cannot afford. I enchant it with Quag Sickness, and with two Swamps in play it’s now a 1/2- much more manageable. Not to be outdone, Sam drops a fresh Water Servant the next turn, and I’m back where I started. Still, I drop a Barony Vampire, my fourth on the table. Turn 8 arrives, and Sam draws into a Solemn Offering. Just like that, my Quag Sickness is undone, and her next attack sees me to 11 life. Again, though, I break her back when my 5th Vampire is played- a turn 8 Barony Vampire, and in quick succession I steal my way through to win, with a final Giant Growth seeing the job done. And for three turns, I’m actually right. I draw him on my fourth turn, having already played the game’s only critter thus far, another Viscera Seer. Sam’s turn 3 play is a Wall of Frost, and things start to look like a repeat as I cast a Barony Vampire and the Captivating Vampire the turn following. Looking at the arsenal in my hand, I suspect Sam’s in for a quick loss. She’s surprised when turn 5 brings me a Spined Wurm (a reprint from my much-beloved Tempest), and when I Doom Blade her Wall and storm in the next turn for 13, she’s in real trouble. But Sam’s had some time to finagle with her deck, casting an Augury Owl, Foresee, and Jace’s Ingenuity to filter and refresh her hand. The turn 7 Sleep is a lifesaver, which she follows up with a Scroll Thief. She Sleeps me again on turn 8, netting a free card from the attacking Thief (alongside the Owl, who’s now pecked me twice). All I can do is lay down a Socerer’s Strongbox, but I catch a break and crack it on the first try. But the damage has been done. Sam’s stalling has robbed me of the overwhelming momentum I had in the midgame, being one attack away from certain victory. And now she’s put some defenders in place: Maritime Guard, Water Servant, and a Cloud Elemental now stare back across at me. While Sam’s at 6 life, she’s well-entrenched, and my best recourse now is either to wear her down with waves of attacks, or find another way to her. When I draw a Diabolic Tutor on turn 9, I know it’s now my chance. I cast it, and go fishing. Turn 10 sees more stalling from Sam as she plays another Foresee and drops a Blinding Mage down. I surprise her with a Howling Banshee. The 3/3 body is welcome but not all that helpful; her enters-the-battlefield ability, however, is. Now clinging to three life, Sam throws out an Air Servant, but has no answer when I untap and cast the Corrupt that I tutored for, for four damage. Just like that, it’s a sweep. I certainly was the beneficiary of good fortune in these three games, I don’t want to give the idea that the Power of Prophesy is a cakewalk, but having the Captivating Vampire out for each of the three games (while she drew into her Sphinx just the once, and promptly had it stolen) lends to a one-sided appearance. Still, as we’ll see in the next post, the deck is indeed designed to get the Captivating fellow out early, and is built around him. Join me in just two days as we break the deck apart and see for ourselves! Captivating Vampire is the nuts if you can get him out. Despite his nickname, Edward Cullen, he really does do things and doesn’t just flail about ineffectually and run away from his girlfriend. If you can get enough of his friends around, you can steal the entire opposing team in a few turns, which is what happened to me in one game I played against the deck. We had fun imagining the Armored Cancrix as a vampire and wondering where its fangs were. However, the lack of fatties in the deck means you’re dependent on your kill spells (few that there are), spined wurms and possible stealing to protect you from the other decks’ massive guys. And it shows when played. You were lucky to see the captivating vampire and corrupts in the games that you played, as well as playing against the deck lacking in serious fat. I look forward to the deck deconstruct tomorrow. Sorry about the delay in the comments. I haven’t been able to think of anything to say, but today’s post broke my writer’s block. Oh yeah, also The Mana Pool read my email plug in their most recent episode. Episode 137. Unfortunately, I don’t have a time on it, but it’s in there. Thanks for the plug! I’ll have to give the episode a listen. For of all, this site is great, thanks for all the info. Well me and my girlfriend bought a 2011 core each. In fact I gave her one and she gave me another. I got Blades of Victory and she got Reign of Vampirism. I’m off to a slow start because we haven’t been playing magic for long (we started a few months ago), and I’n ve only played decks with red involved. Rapid Fire, Hands of Flame and one oldie Champions of Kamigawa red deck. My girlfriend however has got the experience of playing black decks with vampires on them. I lost our first game, and won the second, but after she decided to edit her deck a bit and added the butcher and few weenies I can’t win once. Mostly because the “black” of my Blades of Victory isn’t exacly effective against another black. Cards like Adarkar Valkyrie that i’ve tried to improve my deck with, can pretty much postpone my death until she has taken most of my creatures and strucked me down with them. (that’s when the black proves to be effective, when she’s got my creatures I can kill them). On the other hand, a couple more White Knights could surely help. In fact Blades of Victory would be better off as a knight deck (I firmly believe from the top of my few months of experience). But Reign of Vampirism is a true nightmare, especially if it gets a little improved, with a couple other options rather than the single file strategy of the Cullen family “tap dance”. If you’re looking to make a tribal theme around Knights, they’ve finally found their lord in M11’s Knight Exemplar. They’re a little pricier right now (since they’re new), but widely expected to dip in price once folks ee how niche they are. Good luck, and let us know how things develop!